Speaking under the Ambrogio Lorenzetti’s allegoric frescoes of good and bad government, Thorbjørn Jagland, chair of the Nobel prize committee, said that Europe is surely not perfect, but that it has the power to solve ‘our problems together’. “We need institutions to ensure that both nation-states and individuals exercise compromise, self-control and moderation,” he said, adding that these are the principal needs in a world full of the dangers of the 21st? century. Collecting the prize in Oslo, Herman Van Rompuy, president of the European Council, stressed the need for further fraternity between European nations in a time of uncertainty. The Union has perfected the art of compromise, conceded Van Rompuy. “No drama of victory or defeat, but ensuring all countries emerge victorious from talks. For this, boring politics is a small price to pay,” he added. But peace is not enough. “We must stand together. We have collective responsibility. Without this European cooperation, the result might easily have been new protectionism, new nationalism, with the risk that the ground gained would be lost,” Jagland said. Referring obliquely to the financial crisis that is affecting innocent people, the Nobel committee chair underscored the Union’s political set up, and stressed it must be consolidated. EU leaders are meeting this week to discuss proposals for deepening integration and adopting a time-bound roadmap for the Economic and Monetary Union. Inking a fresh agreement will be tough as divisions persist on whether to allow a two-tier Europe with the eurozone countries at its core. Several EU countries, especially those outside the single currency, have warned against a division between the "ins" and "outs", with second-class members alienated from the decision-making process. Although the Nobel prize is a mere recognition of what was achieved in the past decades to restore peace in Europe, the EU cannot stand still: it must safeguard what it has gained and move forward, the Norwegian host said. Lashing out at those taking peace for granted and trying to reverse the integration process, Barroso said that there can only be peace only if people are confident, at ease with their political system, reassured that their basic rights are respected. Critics, especially in the UK, say the award is inappropriate. 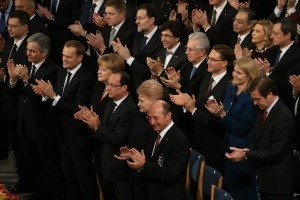 They point out that the eurozone crisis has exposed deep divisions in the 27-nation bloc. Most of Europe's national leaders were at the event, but not the UK's David Cameron, who was represented by the Deputy Prime Minister and Liberal Democrat leader, Nick Clegg. Cameron’s Conservative Party is debating a referendum that could prompt Britain’s exit from the EU. Former Defence Secretary Liam Fox for the Conservatives said today that he hoped "back to a common market" would be the Tories' slogan at the next election. "To be frank, if the choice is between the current trajectory towards ever closer union and leaving, then I would choose to leave, albeit reluctantly,” Fox added. If some want to leave, others should be allowed to join, Jagland said, adding the EU was seeking to lay down the foundations for peace in the Balkans. Slovenia joined the EU in 2004, with Croatia due to follow in 2013. Montenegro has opened membership negotiations, and Serbia and the Former Yugoslav Republic of Macedonia have been given candidate status. “The Balkans were and are a complicated region,” Jagland added, noting that unresolved conflicts remain. The status of Kosovo has still not been settled. Bosnia and Herzegovina is a state that has struggled to function properly because of the veto exercised by the three political groups against each other. “The paramount solution is to extend the process of integration that has applied in the rest of Europe,” the Norwegian host added. “There’s never been as much need to explain Europe in terms of what it brings and what it represents as a project for the future,” said Jacques Delors in an exclusive interview with Euronews. Referring to the countries that are in difficulties, like Greece and Spain, they never say ‘Our governments have made blunders, we are paying for them’. No, they say ‘It’s the dominant ideology, or even it’s Europe’s fault’, he said. “I’ll tell you simply, since I’m no longer in the business and in my day things were a little simpler, but these causes have to be attacked. Firstly, it’s not for the president of the Commission to go touring all over Europe. Governments, instead of saying it’s Brussels’ fault or the United States’ fault, should be saying, ‘You know, that’s how we’ve done it up until now, we have to continue, and we’ll get there in the end’, whether it’s from a point of view of living together, or employment and development,” said Delors. According to the President, during eight years of its membership in the EU, Lithuania has gained confidence from the international community. “Next year, Lithuania will be entrusted with presidency of the Council of the European Union. This is not only a great responsibility for Europe's future but also another opportunity to show the world that Lithuania is a democratic country that cherishes European values,” she said. “As we speak, the EU is destroying democracy across Europe. Just look at the violence and riots caused by EU-enforced austerity measures in Greece, Spain and Italy. The peoples of Greece, Portugal and Ireland can no longer, by the ballot box, change the economic policy of their states because they are now dictated to by the un-elected Troika of EU /ECB and IMF,” he added. The European Trade Union Confederation (ETUC) hailed the awarding of the Nobel Peace prize, but underlined that social concerns must be an integral part of EU policies. “To guarantee its full entitlement to this Prize, the Union must make sure that the social dimension is not considered as an obstacle or an adjustment variable. Europe must come across as the solution, not as the problem,” added the ETUC. “All Europeans should fell delight and proud to see the Nobel Prize given to the European Union today. December the 10th, 2012, has to remain an unforgettable and exciting day in the European history. Indeed this prize recognises the importance and the necessity of the European project,” said Pauline Gessant, President of the Young European federalists. "The Nobel committee picked their time carefully, when the EU was in crisis and nationalism on the rise," Jan Techau, director of the Carnegie Europe think-tank, told AFP. "This is a reminder to us. The EU is a key guarantor of peace but we hold this in disregard, we tend to forget." "Today I have been part of the EU's delegation to accept the 2012 Nobel Peace Prize in Oslo. It is a great honour for the European Union to be awarded this prize, and it is particularly pleasing that the EU's role as a peace project has received special recognition. The EU as a peace project is not just a matter for the history books; nor is it just for the member states – today, the EU promotes stability and openness beyond its borders, through an active neighbourhood policy and global development cooperation. The prospect of EU membership is also providing an incentive for democratisation and stabilisation efforts in the Western Balkans, a region that was ravaged by war less than twenty years ago." The official website of the Nobel prize: Award ceremony speech by Thorbjørn Jagland, Chairman of the Norwegian Nobel Committee, Oslo (10 December 2012). There were demonstrations in Norway against this farce and the fact that it cheapened the peace prize. Still, it was amusing to watch the 3 EU wise monkeys accepting it. Its usually dictators who get unelected power, and its usually they that are anti peace. Not much elected power in the EU is there? “To be frank, if the choice is between the current trajectory towards ever closer union and leaving, then I would choose to leave, albeit reluctantly,” Fox added. Appreciate your honesty; GOOD BYE! !